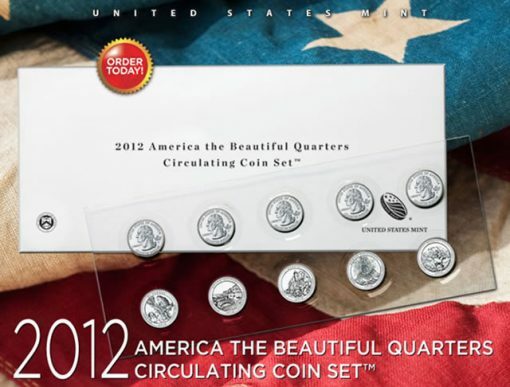 2012 America the Beautiful Quarters Circulating Coin Sets were released Thursday, November 8, 2012. U.S. Mint promotion image of its 2012 America the Beautiful Quarters Circulating Coin Set. The sets are produced for collectors. The packaging is designed for easy access to the quarters. Pricing is $5.95, one of the lowest priced products offered by the United States Mint, and it is a $4 savings off the price of the two previous years’ circulating coin sets. This issue showcases 10 clad coins in circulating quality. Since the Philadelphia Mint and Denver Mint are the facilities tasked with producing all of America’s circulating coinage for commerce, five of the quarters in this set are from Philadelphia with the "P" mint mark, and the other five originate from Denver with the "D" mint mark. Included 2012 America the Beautiful Quarters honor El Yunque National Forest in Puerto Rico, Chaco Culture National Historical Park in New Mexico, Acadia National Park in Maine, Hawai’i Volcanoes National Park in Hawaii and Denali National Park and Preserve in Alaska. Their designs are described toward the end of this article. A feature of circulating coin sets specific for collectors is the easy removal of the quarters from the packaging, so they can be placed into coin albums or other numismatic accessories. What truly makes this product desirable for collectors, though, is that it provides the easiest and perhaps most economical means of acquiring a circulating quality P & D quarter of each design in a very short time. Not all banks carry every quarter design, and when they do, it is typically from one Mint facility instead of both. Plus, waiting to find all of the quarters from banks or in pocket change may take months, even years. With this latest launch, collectors have four options of quarter-only sets featuring 2012 designs. Each one is listed below, along with their number of coins, release dates, price, and current sales as of November 5, 2012. Sales for the new circulating coin sets are expected to be high with several thousand taken in the first week, based on the success of 2010- and 2011-dated versions. When the inaugural 2010 set launched, 5,684 were ordered within their first three days of availability and 28,342 have sold-to-date. Early demand was higher in 2011 when 10,089 sets were purchased in the first six days. At present, collectors have scooped up 21,959 of those circulating sets. Both sets are still for sale today by the U.S. Mint, and could be for a while as neither of them were placed on the Mint’s latest Last Chance Sale. Orders are being accepted online at the United States Mint website found here, and by phone at 1-800-USA-MINT (872-6468). There are no household order limits, and a shipping and handling fee of $4.95 will be added to all domestic orders. Future America the Beautiful Quarters Circulating Coin Sets and related products can be obtained via the United States Mint Online Subscription Program. Each reverse also includes inscriptions of the name of the site honored, the state or territory where the site is located, 2012 and E PLURIBUS UNUM. Common on all America the Beautiful Quarters is a portrait of George Washington, the first U.S. President, on their obverse. The image was initially used on the 1932 circulating quarter dollar but it has been digitally enhanced to bring out the subtle details and beauty of the original model by John Flanagan. Obverse inscriptions are UNITED STATES OF AMERICA, LIBERTY, IN GOD WE TRUST and QUARTER DOLLAR. The America the Beautiful Quarters Program will encompass fifty-six coins by the time it is completed in 2021. One site of national interest has already been selected from each state, the District of Columbia and the five US territories, and their year of release depends on the order of when each site came under direct control of the federal government. If the mint would put the ABT *S mint circulating quarter in the set, that would be great.